Old map by BRITISH ADMIRALTY CHART. - Africa east coast Chale Point to Pangani including the island of Pemba surveyed by Commander WJL Wharton HM surveying ship Fawn . . . Title: Africa east coast Chale Point to Pangani including the island of Pemba surveyed by Commander WJL Wharton HM surveying ship Fawn . . . Size: 38.6 x 29.1 inches. Condition: Paper slightly age-toned as usual. A few tears into margins. A fine Hydrographic Office chart no. 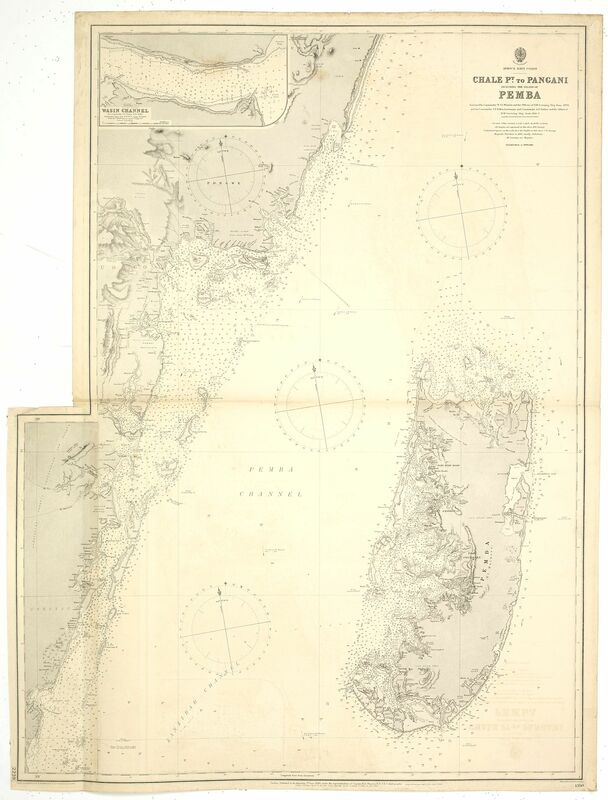 1390 of Pemba channel with one inset plan. Irregular shape. Inset: Wasin Channel by Commander T F Pullen. Engraved by Davies and Company. London : Published at the Admiralty 1st. sept. 1890 under the Superintendence of Captn. WJL Wharton, R.N. Hydrographer : Sold by J.D. Potter agent for the Admiralty charts, 31 Poultry & 11 King Street, Tower Hill". Full title : "Africa east coast Chale Point to Pangani including the island of Pemba surveyed by Commander WJL Wharton HM surveying ship Fawn and by Commander TF Pullen HM surveying ship Stork 1888-9.